Gina understands the importance of a beautiful smile through her work as a dental hygienist. She teaches patients every day on how to keep their smiles beautiful and healthy, but she was not very confident in her own smile. Bonding on her two front teeth was chipping and was unattractive. She was also unhappy with the length and color of her teeth. When she smiled, Gina’s front teeth were different in length due to excess gums showing on her lateral incisors . She also had wear on her two front teeth from severe grinding. Gina was generally happy with her smile other than her four front teeth, so we decided to treat the four front teeth only. I work helping to maintain beautiful smiles everyday, but I didn't feel confident about my own smile. For a long time,.I had wanted to fix my front teeth. They bothered me with being discolored and worn down looking, especially since I work in the dental field. Dr. Troy Gombert is the first dentist in whose skills I felt confident in. I finally felt comfortable enough with someone to have my smile completed." 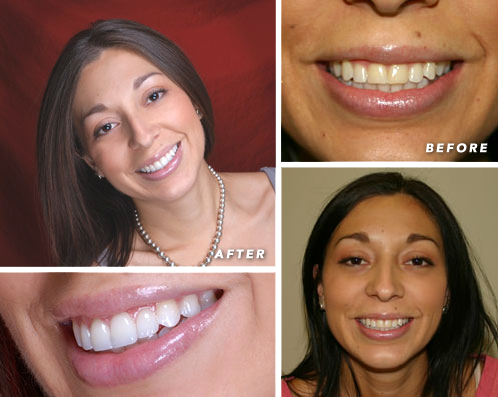 Gina’s results demonstrate how minor, conservative aesthetic procedures can greatly enhance one’s smile.